Choosing the best CPA review can take significant research. To make this easier, we’ve compiled information on 2019’s best CPA courses. Compare features and get money-saving coupons below. Who has the best CPA Review Course in 2019? Anyone can say they are the best, so naturally many providers do. Unfortunately, these claims are easily accepted as fact, but who decides which course is truly the best? You should know that I have an ownership interest in both CPA Review for Free and Fast Forward Academy. In my opinion, Fast Forward Academy is one of 2019’s best CPA courses and, for your money, it is the best course. But, hey, I own it, so you may want to ask some of our customers. What you are about to read is my personal opinion, based on real experience competing in the industry and witnessing first hand the many claims made about courses you are considering, including mine. I won’t waste your time with a one-sided sales pitch. It’s time to spill the beans on the CPA review industry. CPA exam pass rates. The big fat lie! Is Adaptive Learning a Marketing Gimmick? Can you trust online CPA course reviews? Let’s pull back the curtain! I realize you probably care about pass rates because people inquire about them often. Let’s face it, companies that sell review courses are in the exam passing business. The AICPA’s official pass rate is around 50%. Would you buy a prep course with a 50% pass rate? The answer is you wouldn't, and marketers know this, so let the pass rate shell games begin! Several years ago we participated in the industry practice of advertising our pass rate data. We sent surveys to real students, collected the data in a fair and unbiased manner, and arrived at a pass rate of 92% based on survey responses. We were very happy with our results and were eager to share it with the world. We were completely transparent in the process, and the numbers don’t lie, so we thought, but they can be deceiving! Would you buy a CPA course with a 92% pass rate? This information does not come from a 3rd party survey or word of mouth. It is not a speculation. It’s the official result of all test takers published by the AICPA. This is the most accurate source for pass rate data. A couple years had passed from when we first started publishing our CPA exam pass rates when I noticed most of the other CPA review courses consistently making similar claims. It seemed as though many were reporting around a 90% pass rate. I knew that if these claimed pass rates were accurate, the AICPA pass rates should begin to move higher - much higher! Every time I’d check quarterly results on the AICPA site, there was virtually no upward movement and sometimes I’d see rates drop slightly. This is not what I was expecting to see at all. Sales and marketing departments love selling pass rates. Several providers promote some unbelievable pass rates when you consider the official AICPA pass rate is around 50%. Everybody seems to have a 90% pass rate. What courses do the students who fail use? It's just my opinion, but the answer clearly, must be all of them! Every course has students who fail and it is doubtful they will tell you exactly what percentage that used their product failed. Our 92% pass rate just didn’t feel right, so we voluntarily stopped publishing pass rates a long time ago. It is very tempting to claim the highest pass rate, and nobody is stopping us, but you deserve better. Here’s the issue—and it’s a big one—an education provider does not receive official exam results from Prometric or the AICPA. There is no standard definition of what a provider considers in determining a pass rate. The providers decide who they want to count and how they want to present the data to you. Exam results are confidential, so the only way to tell who passes or fails is by asking each student directly. Many providers use surveys. We found that only a small percentage of students tend to respond to these types of questions, and students who fail may be less likely to share their failures. This is called reporting bias. It’s because of reporting bias, that pass rate surveys tend to primarily attract the successful students, thus this data may be flawed right from the start. Validating these responses is challenging. If a provider is not using verifiable information, it is at best unreliable. Students who fail are much less likely to report results than students who pass. Published pass rates likely do not reflect all students who use the courses. Is it dishonest if a provider understands this but continues to feed you bogus pass rates? Statistics don’t lie, but liars often use statistics! I will dedicate a full page on this website to tout the pass rate of any provider that can prove (with verifiable facts) a pass rate near 90% for all students who use their CPA course. This is an open challenge for any provider to back up these claims. Several companies claim to offer bleeding edge technology and some even “guarantee” your success. Using terms like “adaptive learning” to describe the magic that allows you to pass faster but study less. Just a hunch, using a fancy trademark to describe a course is not likely to make it any better, but if you believe what is claimed, it helps the marketing department sell it to you. Should you rely on claims like these? Let’s take a closer look. The general consensus for many years among review providers is that the total amount of study time for the CPA exam varies by student, but tends to be around 450 hours. You didn’t misread that. I find it interesting that a provider claims time savings of approximately the total amount of time a typical student may study for the CPA exam. The Fast Forward CPA course is not adaptive, but I am a big believer in using technology to make it easier for you to learn. As a student, I saw a lack of technological innovation, not an abundance of it. I became interested in professional exam preparation as a business because I saw a real opportunity to create a better online experience for students at a time when nobody else seemed to care about technology. Now many of the CPA exam prep providers tout “adaptive” and efficient platforms in their marketing, and everybody wants you to believe they have superior technology. So, this begs the question—Why would companies, who for decades have done little to improve their learning technology, all of a sudden claim to be innovative? The answer is simple. It sells! I’m having trouble believing this hype, what about you? It seems like you can’t search for anything on the web these days without running into a review site. You know, the sites that are supposed to rank products and give objective reviews so that you can make an informed buying decision? If you are thinking of buying a CPA exam preparation course, you are probably looking at online reviews to be sure that you are making the right choice. These courses typically cost between $1,000 and $3,500. That's money well spent if it is the difference between a pass and a fail. The concept of affiliate marketing is simple. A company can strike a deal with an affiliate to send more customers its way. Affiliates create websites and shoot “product review” videos to influence visitors to purchase products so they can reap the reward of a commission on each purchase. You can find affiliate programs for almost anything that can be bought or sold online, from t-shirts to saucepans to car rentals and, yes, CPA review courses. CPA course comparison websites are easy to find because affiliates earn more money as they attract more readers. As a result, the most skilled internet marketers run the most visible review sites. Many employ a full-time marketing staff to improve search engine rankings. Is a Paid Promoter the Best Source of Unbiased Information? Does Becker deserve the last place ranking? Why is Becker CPA Review ranked dead last on so many review comparison websites? Becker has been a leader in the CPA exam prep industry for decades and they have a decent course in my opinion. The answer is simple, affiliates have nothing to gain by giving Becker a favorable ranking because Becker, to my knowledge, does not pay affiliate commissions. It makes more business sense for an affiliate to recommend courses with the best commission sharing arrangements, which is why the recommended “Best CPA Review Course of 2019” may be the one that generates the most money for the affiliate. How can free questions be bad? Another example is cpareviewforfree.com. My company purchased the assets of the company as we saw value in the large number of quality questions and simulations. In addition, the website was an established success and already had a long history of helping students pass the CPA exam. Many of these students also use additional study materials, so it was a good way to introduce Fast Forward Academy. One of the original founders is an award-winning accounting professor, Joe Hoyle. He and I share a similar vision. We continue to employ this simple philosophy today for CPA Review for Free. We completely rebuilt the website adding new features and a better study experience. You would think an “unbiased” reviewer would have no problem recommending a quality free resource with good rankings. Because affiliates are unable to generate revenue recommending free questions, it is difficult to get a favorable review. Do the “best” courses pay affiliate commissions? If you don’t pay commissions to the reviewer you are very unlikely to outrank those that do. In many cases, companies that do not pay affiliate commissions are not mentioned, or in some cases treated unfairly and painted in a negative light. I know this from real experience. Fast Forward Academy ended its affiliate relationships in late 2016. As soon as commission payments ended, the reviews and rankings on many of the affiliate websites took an immediate nosedive. Referral traffic came to a screeching halt. We felt it necessary to file a lawsuit to defend the company’s reputation when a former affiliate published what we felt were disparaging, false and defamatory statements. Of course, we do not feel any of this was true, but serious damage was done. Fast Forward Academy again pays affiliate commissions to CPA course comparison websites. We do not pay for high rankings, we pay to be included in the conversation when potential customers decide which CPA course to choose. Unfortunately, we feel participation is necessary as long as these comparison websites continue to outrank CPA review course providers in the search engines. Is it possible to buy favorable reviews? Some companies are more than happy to pay fat commissions for favorable reviews. I was approached by one such company offering a sweet deal in exchange for a top ranking in the course comparison page on cpareviewforfree.com. Later that week, I received a press release from this same company in my email inbox touting their newfound status as the #1 provider in CPA. It appears they found a shill to do their bidding. It certainly wasn’t us. Coincidently, many of the same companies that advertise unbelievable pass rates have lucrative agreements in place with paid promoters, and not surprisingly are often highly recommended. Caveat emptor! So Where can you Find an Honest Review? One word — students. We believe that a truly unbiased opinion from a student can help you make a more informed decision about which CPA prep course to choose. Many of the students who study on this website also use other exam prep courses. We are in a unique position to learn from our diverse audience of CPA candidates. We started asking real students about their personal experiences with the courses they use. We do not write or editorialize any of the reviews found on CPA Review For Free—students do. We do not pay for these reviews, so the author of the review is not influenced by a commission. This is one of the many efforts we take to keep these reviews honest. With that said, if you use any of the CPA discount codes available on this website, we'll probably get a commission. This helps maintain the website and allows us to continue offering CPA questions for free. While reading reviews from actual users is a good start, we suggest you try a few courses first. In many ways, CPA review courses are more similar than you think. Every course has students who pass and students who fail. Nobody can guarantee you pass, regardless of what they say. Most everyone offers a physical textbook along with an online version of their course content. The most popular courses provide a study bank of exam questions for you to quiz yourself, video lectures, and in most cases, you can take practice exams at the end. Since so much of your time will be spent with the CPA prep course, you will want to spend some time evaluating the study material before you commit your precious time and money. Don’t fall for the gimmicks and end up paying twice as much for unproven claims. 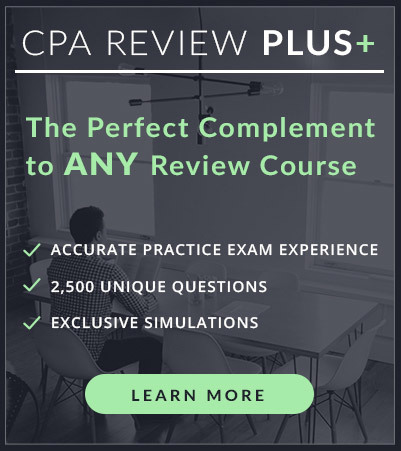 So, what is the best CPA review course of 2019? The answer will depend on what is valuable to you. I prefer quality and efficiency at a reasonable price. The goal of Fast Forward Academy is to make it easy to learn, easy to focus, and easy to succeed. But don’t take my word for it, take it for a test-drive, right now. Clunky courses can waste time and force you to study a certain way. Look for courses that grant flexibility and have easy-to-use navigation. Before you purchase, check the fine print. Many guarantees come with restrictive hoops to jump through. The exam is tough and quality support can make all the difference. Choose a course that makes it easy to connect and get help on difficult topics. Lectures break down complex topics and present them in a clear, efficient way. Choose a course with lectures that are engaging and concise. Pass rates are the worst reason to purchase a course. Remember, the exam pass rate is only 50%. Don’t fall for gimmicks like “adaptive” learning. While helpful, this technology has plenty of room to grow. Focus on courses with detailed analytics. A great test-bank will help you pass, but question count isn’t everything. Make sure your review course has detailed explanations and great progress analytics to help you learn. You may enjoy specific features in one course better than another. Lower priced courses can be combined to better fit your learning style.